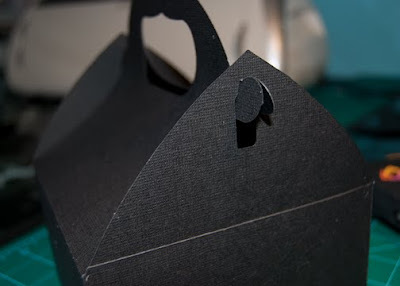 Design.Create.Inspire: GABLE BOX Gypsy file IS READY!!!! GABLE BOX Gypsy file IS READY!!!! oh my, thank you so much for being so patient!!! I know some of you have been waiting for this all day. Well I went and messed up all the welding I had painstakingly finished on the box! Talk about frustration. So, thanks to that glitch I am offering you a WONDERFUL GABLE BOX sans score marks. Better than nothing right? LOL!!!! open up your file. You will see that I have included the list of cartridges that were used in the design. 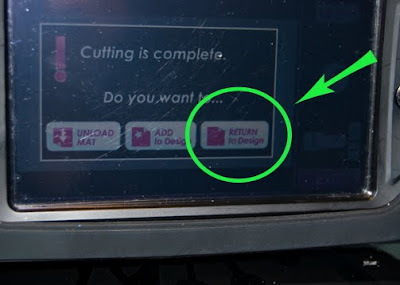 If you do not want these to cut out as well please delete these before you select the cut button. Once your box has been cut, your gypsy will ask you what you want to do. DO NOT UNLOAD THE MAT!!!! Instead select Return to Design. Once you are back on page one, look in the top right hand corner of your screen and touch your stylus to the number 1. It will change to the number 2. 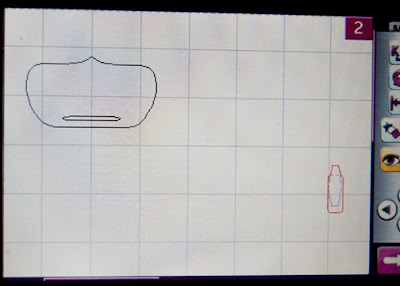 You are now on page 2 of the design. 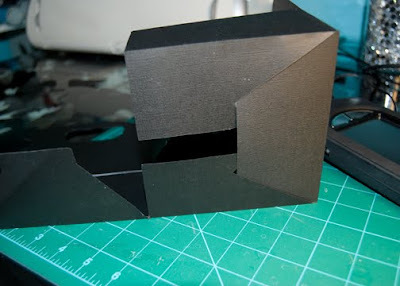 This page is for the handle cutouts and holes to keep the box closed. (these holes had to be on this page as they were welded and my gypsy went wonky with the welding when I had it on page 1 originally). 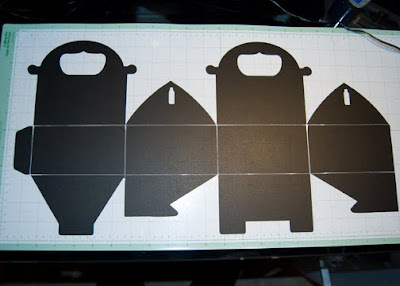 Now all you have to do is select CUT, your mat is STILL loaded into the cricut at this point and the gypsy will only cut what is on page 2. Now as I said previously, my score marks were a bust~I am going to try them again tomorrow and see where I get. For now I have shown a picture demonstrating where the scormarks should be. You will make 2 long horizontal marks using a long ruler. Then you will make 4 smaller score marks vertically. Use the photo as a guide. 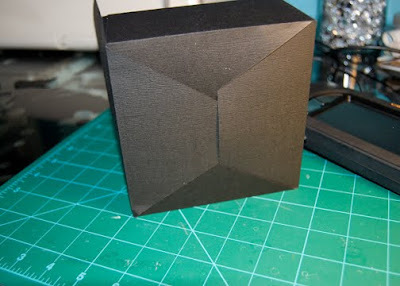 Now that everything has been scored and folded/creased your box is ready for assembly. 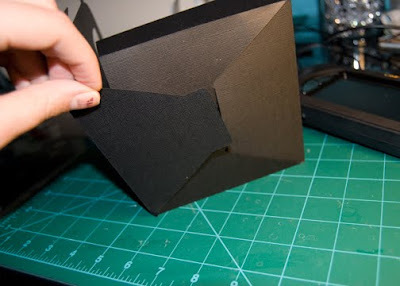 Start with it laying flat and lift up the right side of the box. 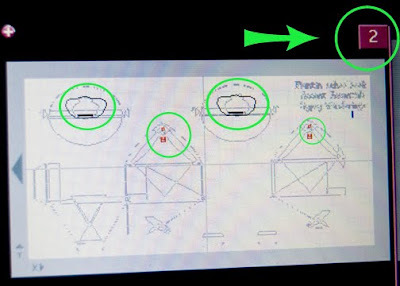 Slide the right side of the box towards the bottom and have that side slip in behind the tab~as shown in photo. Next fold the top piece down and tuck behind that tab as shown in the photo. 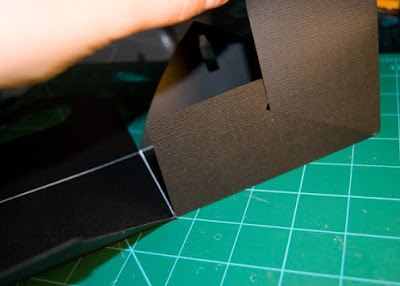 Don't forget to add ahesive to your box after you've tried DRY FITTING IT a couple times....practice putting the bottom together before you get the glue out ok?? 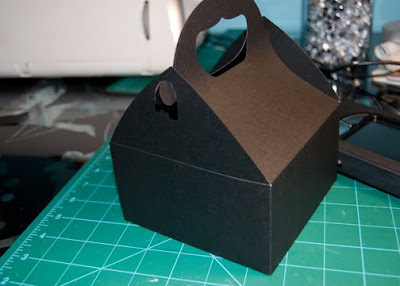 And finally~the long awaited GABLE BOX!!! Overall Dimensions: 5.25"Lx7"H(including the handles in this measurement)x5.25"D.
Don't forget I haven't dressed this box yet, but already you can see it has good bones and will turn into something wonderful! Wow this is great Crystal what a clever girl you are, just wish I had a gypsy to go with the cut file lol. Congratulations on winning such an aweome prize, well done. Super fantastic. I can't believe you're thanking us for our patience. We need to be bowing down to you. You are so creative and generous. Thank you so much. Hope you get to sleep in. I just got my Gypsy and I am trying to download your Gable box design but I am not able to open it on my MacBook. I am new to this so if you could walk me through how to transfer the file to my MacBook I would so appreciate it!! OH boy! I love gable boxes! Wow you did it! Guess what? I got my Gypsy on Wednesday and have not even opened the big box yet!! All I can say is WOW. You do such beautiful and intricate work. Thanks for the cut file and for all of the work you put into it. I am going to give it a try. What a great box. Thank you for sharing your talent with us. Thank you so much for the box files! Your designs are amazing and so appreciated. Your hard work shows in these lovely boxes. OK you are the bestest!! this is a great box, thanks for sharing with us. I love this! Thank you so much for sharing your designs, Magoo! I love it! Thank you for sharing your designs. I can't wait to try this. Thanks so much for the Gable Box. I left you some love on my blog. I would love to have you drop by and pick it up. This is the best box ever!!! You are so awesome for creating and sharing this! This box Rocks! You are awesome. Thank you for sharing. You are simply AMAZING! I would need an engineering degree before I could even begin to figure out something like this! Thank you so much for sharing your talent with the rest of us!! 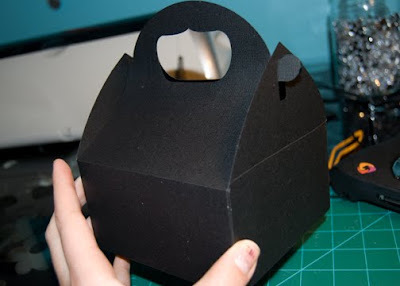 Thank you for sharing your gable box. Can't wait to try it. Hi, I just wanted to tell you that your work is awesome. I have been on the MB and saw your work there. Also thanks for the Gypsy button, I was able to put in on my blog with the instructions you had. I LOVE your site! You make it so easy to navigate to get to what we are looking for and that is AWESOME! Not only do I LOVE your site but I also love your projects and your ability to share with us as you make us think and take us inside of our creativity zone so we to can believe enough in oneself to produce and create as you have done time after time. Thanks for all that you do! Girl, YOU KNOW I LOVE YOU! Wow! I am so impressed. I hope I have the same cartridges that you used. (fingers crossed) You are very good with your instructions. BTW: I love the Christmas decorations. Awesome! Can't imagine the time and effort it would have taken to design. You are so generous in sharing this. Thank you. I just wish i had all those cartridges so i could cut it out.. i ll have to fiddle with mine some more.. THANK YOU!! THANK YOU!!! LOVE your box!!! BLESS YOU!! for creating this AND SHaring!!! It's me cricaholic from the MB. I don't have a 12x24 mat and when I shrunk your design I messed pg 2 all up!!! 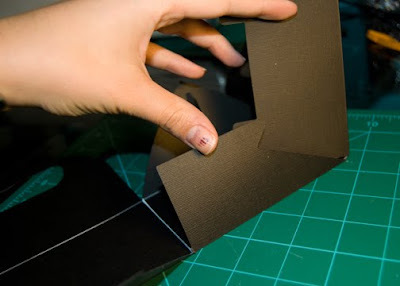 can you make your gable box for a 12x12 mat. THANK YOU! This is a cute lil box. I'm using mine to enclose some cute lil preemie things for my new lil grand daughter! Thanks so much fr sharing! 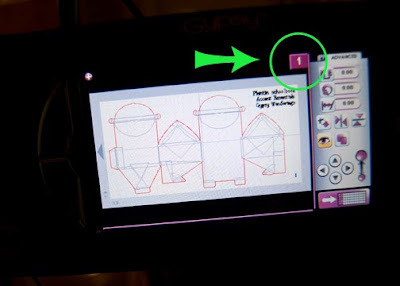 Thank you so much, what an incredible amount of work you put into this (and your other projects) I just wish I knew how to do this myself, but I just started with the cricut and unless in on the cart I just don't seem to get it :-( So thank you again! thanks for sharing this great box!!! Thank you so much for sharing your files!! Great file, thank you for sharing! BIG thanks -- this cut file will be used often. 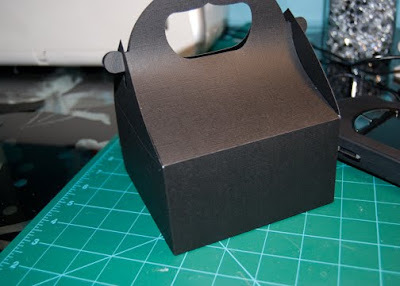 Thank you for Sharing your cut files this box is wonderful idea. I can think of all types of things to use them for! Again thanks! 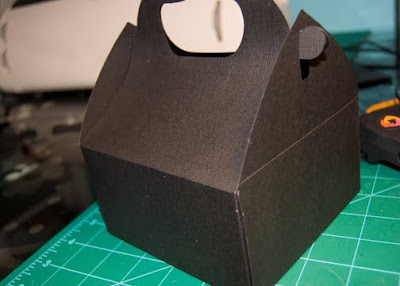 I attempted to make own gable box but I finally gave up! Thank you so much for creating a perfect box! I REALLY appreciate it! You are so talented! Thank you for sharing this hard working file. I can't wait to try it. Okay, so you're saving me more than once in a day. I love this adorable box! Thanks a ton!!!! Very cool box. Thanks & Merry Christmas! Thanks for the file I think I'm going to use it to make goodie boxes for my sons b day party! You do awesome work! This is very cool. Now I have to figure out how to get it to my Gypsy. Thanks for the great box! It looks fantastic. Thanks for your hard work and effort. I appreciate your efforts! Thanks so much for sharing!